This name used to refer to two now defunct species, Ephemerella inermis and Ephemerella infrequens. 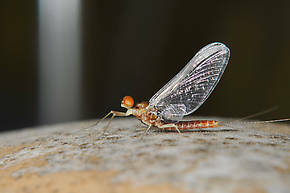 The inermis mayflies were discovered to be the same species as Ephemerella excrucians and now they bear that scientific name. The infrequens species was recently reclassified as a subspecies (Subspecies: Entomologists sometimes further divide a species into distinct groups called subspecies, which have two lower-case words on the end of their scientific name instead of one. The latter is the sub-species name. For example, Maccaffertium mexicanum mexicanum and Maccaffertium mexicanum integrum are two different subspecies of Maccaffertium mexicanum.) of Ephemerella dorothea. 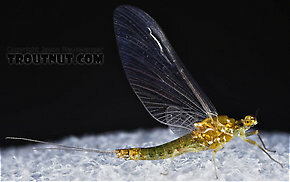 Anglers usually shorten the Pale Morning Dun hatch to the PMD hatch. Like most common names, "Pale Morning Dun" can refer to more than one taxon. They're previewed below, along with 5 specimens. For more detail click through to the scientific names. These are pretty much always called Pale Morning Duns. Ephemerella dorothea infrequens (formerly Ephemerella infrequens), together with its often smaller and later hatching sibling Ephemerella excrucians, make up the most important Western hatches. They go by several common names but are best known as Pale Morning Duns (PMD's). 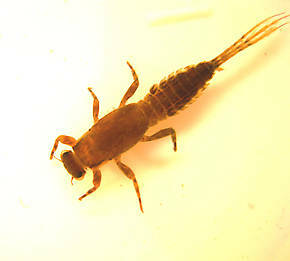 They are rivaled only by the many baetid species that typically bookend them. In terms of availability, consistency and abundance (not to mention their convenient timing and preference for beautiful weather), they have no rival. They can run in size from a large 14 to a small 16 and various shades of illusive yellowish creams, sulfurs, and even yellowish greens, depending on the system they inhabit. 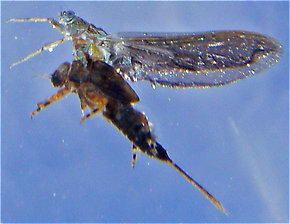 This taxon used to be considered the separate species Ephemerella infrequens, but entomologists now regard it as a subspecies (Subspecies: Entomologists sometimes further divide a species into distinct groups called subspecies, which have two lower-case words on the end of their scientific name instead of one. The latter is the sub-species name. For example, Maccaffertium mexicanum mexicanum and Maccaffertium mexicanum integrum are two different subspecies of Maccaffertium mexicanum.) 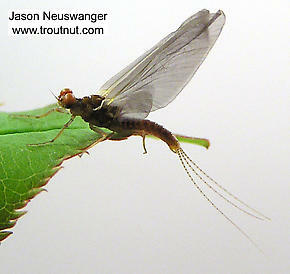 together with the small eastern Pale Evening Dun hatch Ephemerella dorothea dorothea. There is another related listing of significance common in California and the Southwest that has undergone revision. The large (often exceeding 10 mm) Ephemerella mollitia is now considered synonymous with d. infrequens. While it is not the normal policy of TroutNut to list subspecies (Subspecies: Entomologists sometimes further divide a species into distinct groups called subspecies, which have two lower-case words on the end of their scientific name instead of one. The latter is the sub-species name. For example, Maccaffertium mexicanum mexicanum and Maccaffertium mexicanum integrum are two different subspecies of Maccaffertium mexicanum.) as separate taxa, d. infrequens and d. dorothea are so important and distinct from each other in terms of geography, appearence, and angling tradition that they warrant an exception.